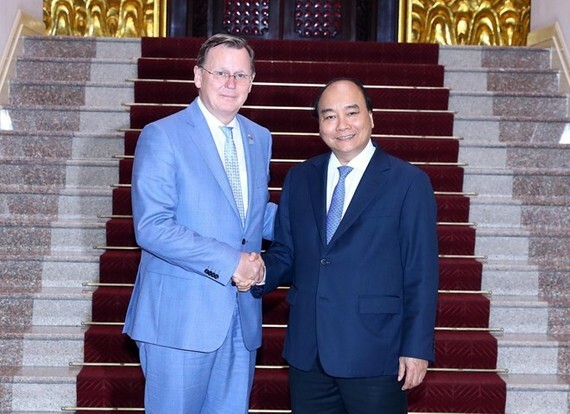 The cooperation between the sides will contribute practically to soon realizing the European Union-Vietnam Free Trade Agreement (EVFTA), PM Phuc said at a reception for Minister-President of Thüringen Bodo Ramelow in Hanoi on April 8. The PM said he is delighted to see positive developments in the relations between Vietnam and Germany. He spoke highly of the visit by Bodo Ramelow and his accompany of representatives from 70 businesses, expressing his hope that the visit would open a new space for investment and cooperation between the two countries in many fields. He also spoke highly of the German businesses and investors in Vietnam, saying the Vietnamese Government is willing to provide information and discuss arising problems with German businesses and investors to help them feel secure doing business in the country. The leader said he knew that Thüringen set up a representative office in Vietnam in 2009 and some 70 businesses from the state are launching business, training and research projects in Vietnam. He said the two countries’ cooperation would be developing, backed by the establishment of strategic partnership, the signing of economic agreements, the launch of a direct flight route, and the German-speaking community in Vietnam and the Vietnamese community in Germany. 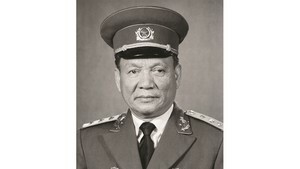 He asked the German official to help encourage businesses of Thüringen and Germany to pour more investments in Vietnam. Minister-President of Thüringen Bodo Ramelow said during the visit, he and his entourage had a working session with Hanoi, joined seminars, and worked with the Ministry of Science and Technology on training partnership between universities of the two countries. He talked about his state’s socio-economic achievements after 30 years of reforms and possibilities of sharing experience in developing small and medium-sized enterprises and cooperating in vocational training by Thüringen businesses. The delegation began their eight-day working visit to Hanoi and Ho Chi Minh City on April 6, at the invitation of Deputy Prime Minister and Foreign Minister Pham Binh Minh. Thüringen has a population of over 2 million and a GDP of more than EUR 60 billion.